Where are you? Home > News > Los Chinches - UK tour starts today! 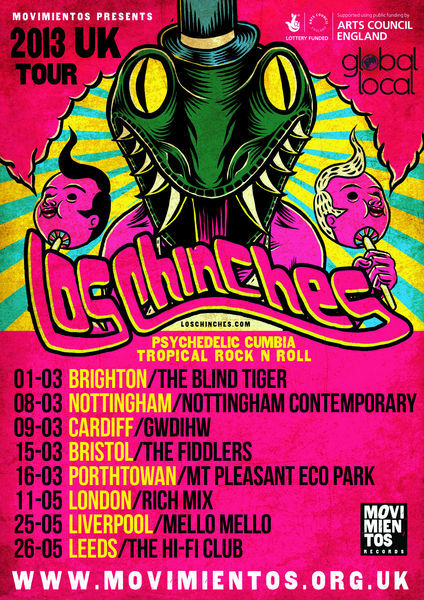 Los Chinches the psychedelic Peruvian cumbia and chicha band start their 2013 UK tour today in Brighton. Drawing upon the retro style of Chicha from 1960s Peru, Los Chinches' epic new sound harnesses the psychedelic twists of Peruvian Cumbia as well as the Punk and Ska spirit of London. This, along with their rocking tropical energy, makes for blistering live performances interlaced with feverishly addictive melodies. Their sound stays faithful to the original bands from the era, such as Juaneco y Su Combo and Los Mirlos, whilst taking influences from 60s garage rock and surf guitar and bringing it bang up-to-date with a distinctly London attitude. Los Chinches' line-up reflects the melting pot of the city from which they emerge, and with Peruvian food and culture currently booming in the capital, now is the time for London's very own Chicha band. Consisting of four Europeans (three from England, one from France) and four Latin American percussionists (three Peruvians and a Colombian), they offer up a unique blend of Chicha with hot Peruvian rhythms going head to head with the amped-up melodies of the London-born keyboard and guitar players. 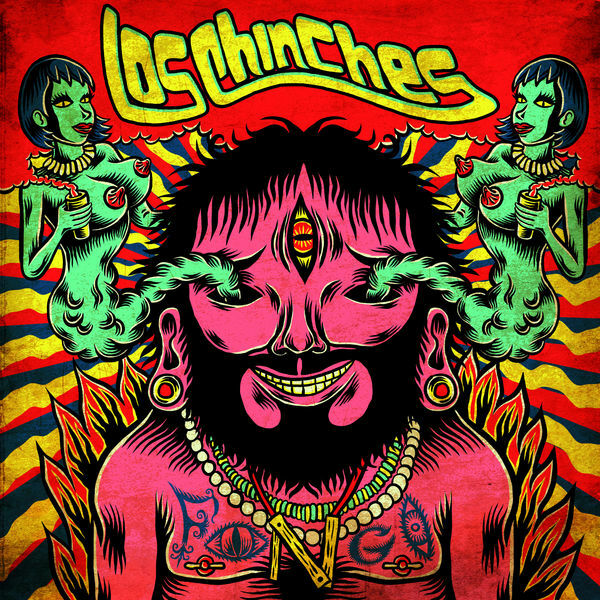 Since forming in 2009, Los Chinches have blazed a trail across the London scene at an eclectic array of club nights, folk events and rock'n' roll venues. They have been part of the prestigious Latin music festival La Linea with a performance at the Barbican, they've packed dance floors at venues such as Cargo and Rich Mix and they've rocked festival stages at Glastonbury, Bestival, The Big Chill and WOMAD. Last year, whilst working on the album, their busy schedule included a tour in the Netherlands, a show at BT London Live (Victoria Park) alongside Ska Cubano and a sell-out gig at the Village Underground in Shoreditch. Gareth Finnegan, rhythm and lead guitarist, first heard the sounds of Chicha whilst lost in the Peruvian Amazon. After many days spent in the company of three mystic Shamans, he ended up in a small bar by the side of the river. Suddenly emanating from the radio, he heard strange and enchanting melodies, tropical rhythms and fuzz guitar, the vibe as hot and sordid as the jungle heat. Finnegan was hooked. "This is Chicha", explained the owner of the bar, who was also the local mechanic. Back in London. Finnegan joined forces with principal songwriter Marty Shtrubel (guitar/ vocals), and virtuoso keyboardist Eleni Hassabis (Katy Carr, Johnny Borrell). 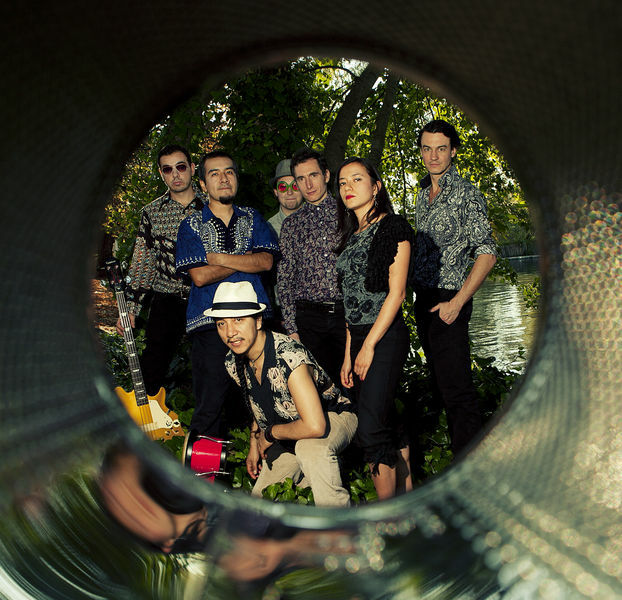 Soon they met güiro player and frontman Carlos "Kanti Kena", who was already active in the London scene with his own Andean fusion band, Lokandes. After a couple of personnel changes, the band finally added three of London's top Latin percussionists to their line-up: renowned Colombian timbale player Alejandro Martinez (Roberto Pla), legendary Peruvian percussionist Kieffer Santander on congas (Susanna Baca, Manos Negras) and consummate DJ/producer Nelson "Papa Chango" Marquez on bongos. On electric bass, they are joined by Thibault Remy, a multi-instrumentalist and bandleader/songwriter for Afro fusion band Awalé. Now in 2013, they are ready to unleash their debut album Fongo onto the world. Its title, Los Chinches explain, is taken from the name of "a mysterious deity, a visionary and a clown with a taste for jungle liquor and Amazonian beauties". It is, they continue, "through Fongo that we channel the spirit of Chicha who acts as a spiritual councillor and a guide for Los Chinches. We ask Fongo to bless us all with good vibrations. There is a Fongo in all of us and our quest is to bring out the spirit of Fongo in everyone who hears our sound. I am Fongo...you are Fongo...we are all Fongo!" The album also includes specially commissioned artwork from Bolivian illustrator, graphic designer and artist Marco Toxico, http://divinogolfo.blogspot.co.uk/ . File under: Tropical/ Peruvian/ Cumbia/ Psychedelic/ Ska - and most definitely London. With thanks to Arts Council England.